Women on a Mission: Mom Edition: WOM WEEKEND: TEACUP PINCUSHION! Lori and I love to sew. We also love to have accessories to go with sewing – thread-catchers, little snips, seam ripper (well, that’s not so much fun as a necessity), button tin – and pincushions! We’ve got ample supplies of all such swag, but we couldn’t resist this little honey – a teacup pincushion! I saw it for the first time as I was scouring various blogs – but I didn’t write down the name of the blog and couldn’t find it again. I had my heart set on it, though, so I went to my good friend, Google. A search of ‘teacup pincushions’ yielded all I needed. Next up: a fat quarter yard of the perfect fabric. (A fat quarter is a ¼ square of a yard of a fabric, as opposed to a ¼ strip of a yard of fabric, which is what you’d get if you had it cut off the bolt. Once you know what you’re looking for, they’re everywhere, and they’re CHEAP. Around $1.00-$3.00 apiece.) I went to my local awesome quilt shop, Fat Quarter, and searched till I found it – a pink, teapot, lilac and lily of the valley masterpiece - $2.25. Perfection! Lori’s search netted her a super white china teacup for $0.25. STEP 1: Iron the fat quarter flat and place your teacup upside down on the fabric. Trace around the edge of the teacup. Then make another circle around the teacup-sized one about 4” larger. We used a compass to make it easy (hello 5th grade skills!). THRIFTY NOTE: Use only as much fabric as you need for your circle (ie, don’t cut your circle out in the center of the fat quarter) and you can get 2 or 3 more circles out of the fabric. STEP 2: Cut two 2” squares of a random scrap of fabric. Lay the pieces right sides together (though this doesn’t really matter) and sew three of the four sides with a sewing machine. Turn right-side out and fill the little pocket with fine sand, then handstitch the open side up. STEP 2A: In the alternative, grab a little round lint trap from Walgreen’s, Super Target or a hardware store. SIDEBAR: The point of the sand or lint trap is that either of these will sharpen the pins as you push the pin through it. The sand version will also add a little weight. STEP 3: Grab an egg-size clump of the polyfill batting and form it into a circle. Lay this on top of the center of your fabric circle. Lay the sand packet or lint trap into the center of the batting ball. STEP 4: Thread thru and stitch all the way around the edge of the circle using one long piece of thread. Do not pull the stitched circle all the way shut, but pull it a little tighter. STEP 5: Grab small bits of batting and squish into the hole till the fabric ball is stuffed nice and full. Pull the thread tight until the center is pretty tightly closed, then knot off the end of the thread. ALTERNATE STEPS 4 and 5: Pull the circle of fabric together, stuff tightly, then cinch up the ends with a hair binder – as though you are tying off a full garbage bag. That’s it. I like the sewn finish, but this would work just fine if you’d rather not hand-stitch. You may need to adjust the amount of batting to get the hair binder to stay on just right. STEP 6: Turn right-side up and set into the teacup. Apply glue around the edges of the teacup where the fabric touches but not visible (about ¼ to ½ of the way down). This will hold the pincushion into the teacup. This is it – but we just had to throw in another step – embellishments!! STEP 7: We picked through our tub of scrap ribbon, bows and flowers and positioned those we ‘picked’ as we liked. Then we glue-gunned the goodies onto the cushion fabric in the location of the teacup handle. Lori opted for nothing on hers. This is really it! SA-WEET! The best part of all – Lori and I did it together. Reminds me of the time we made matching flannel shorts and hair scrunchies for one season’s cheerleading try-outs. But that’s a story for another day. Love it gals! I definitely am going to have to make this!! I just heard about your blog tonight via my sister. I'm following now. Maybe you'll inspire me to sew and be more of a bargain hunter on the prairie? I hope so. Very Cute! I have a homeade pin cushin someone made me out of an old babyfood jar. its ADORABLE plus you can store small things like safety pins and all different stuff. I love mine! 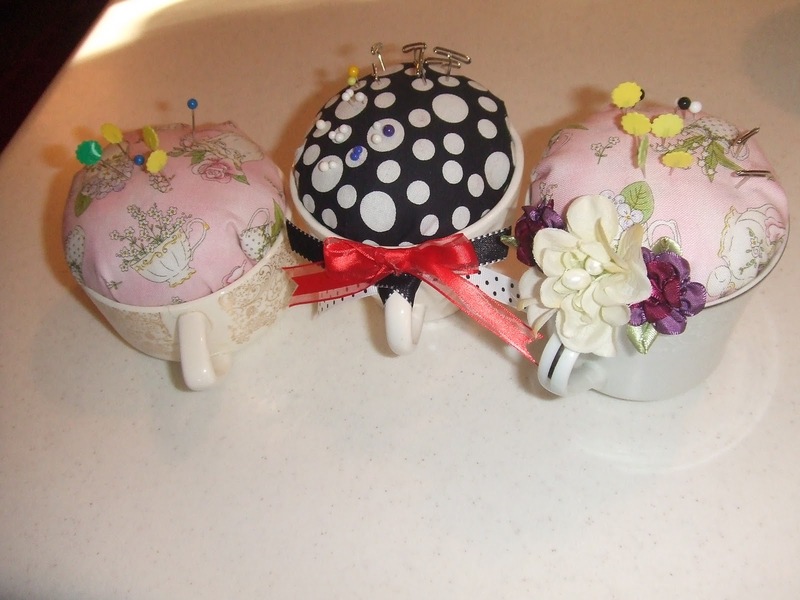 The black and white tea cup pin cushion i love!!! WOM WEEKEND: IKEA FAB FINDS=A FAB CRAFT! WOM WEEKEND: CINNAMON DREAMS, ICING HEAVEN! DOUBLE-HEADER FRIDAY: DRESS RE-STYLE: Flop! DOUBLE-HEADER FRIDAY: It's a Wrap! $1.00 DRESS RE-STYLE: 93X Dress! FIVE INGREDIENTS OR LESS: Pizza Dough! V-DAY GIFTS: THOUGHTFUL AND THRIFTY!